Gone are the good ol’ days when the iOS Music app was just a full-fledged brilliant Music app and not a downright shady gateway for Apple Music. Unfortunately, no one can get the same experience with the native app anymore. 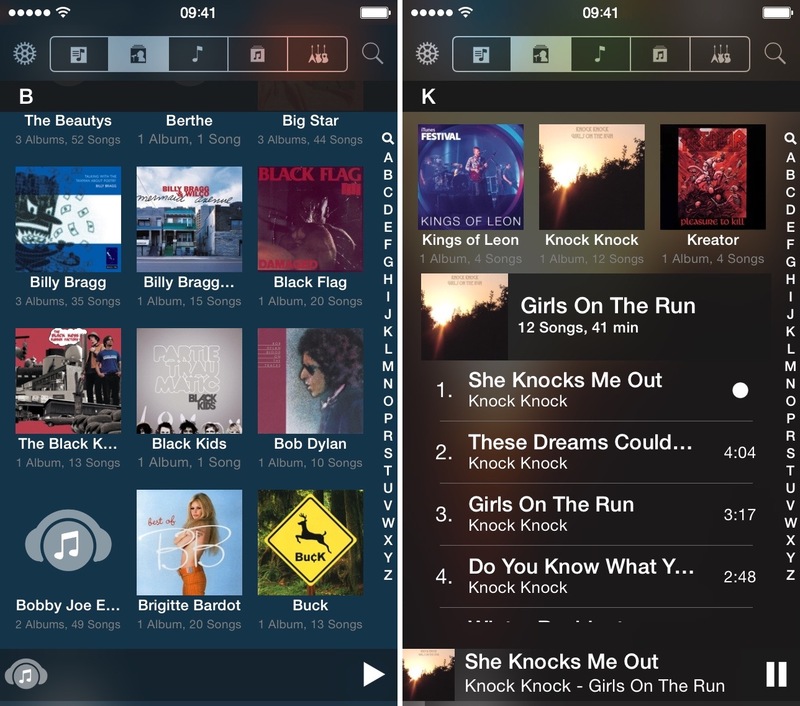 Don’t fret, there are still some amazing third-party offline apps out there that will take care of your tuneage. But, in a sea of bogus iOS music apps that market themselves as the best free music players for iPhone on the internet or claim to be this or that, how does one expect to find a decent iOS music player that plays their favourite music gracefully without iTunes? 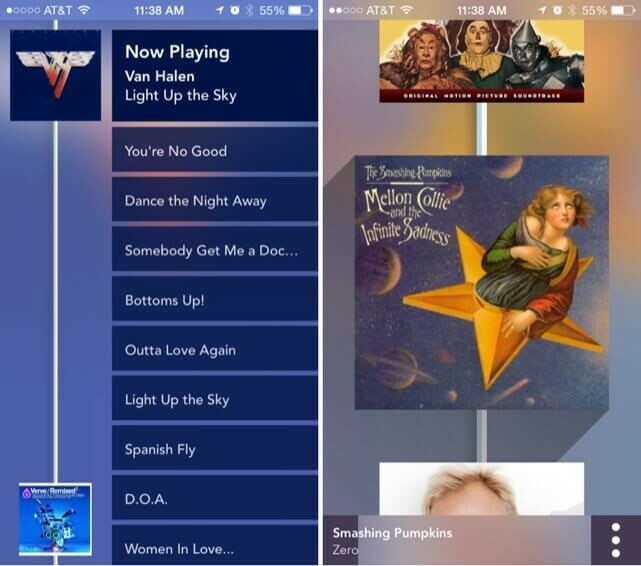 By checking out our roundup of the best free music players for iPhone & iPad, of course! Note We have assembled our roundup of the best free music players for iPhone & iPad based on a gamut of features ranging from: expressive UI, equalizers, gesture control, etc. So, the following items are not ranked in order of their importance. You can download whichever you like. 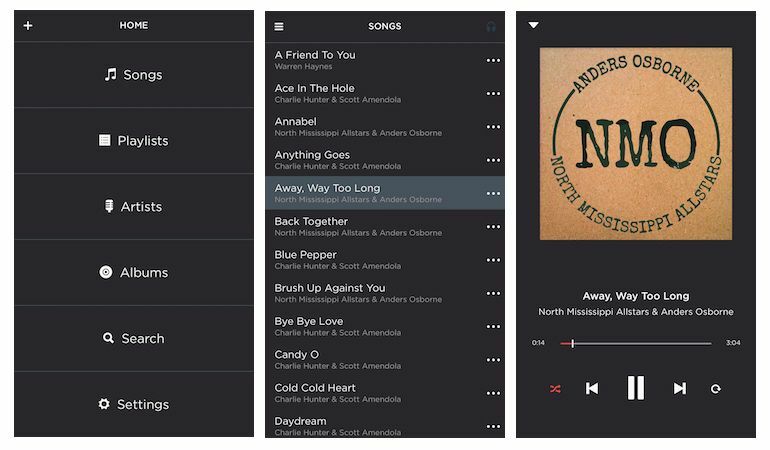 Although Jukebox was originally presented as the best free music players for iPhone which proffered listening to music without iTunes by playing files stored in your Dropbox, but it has come a long a way ever since. Now Jukebox can play any music for you based upon your mood in genres aplenty ranging from emotional jazz to groovy metal. Thanks to a sleek interface and a diverse built-in music library spanning across 15 genres ranging from psychedelic pop to hip-hop, streaming music on an iPhone has never been this easy. Moreover, Jukebox makes it very convenient to easily manage and locate your mp3 songs offline. 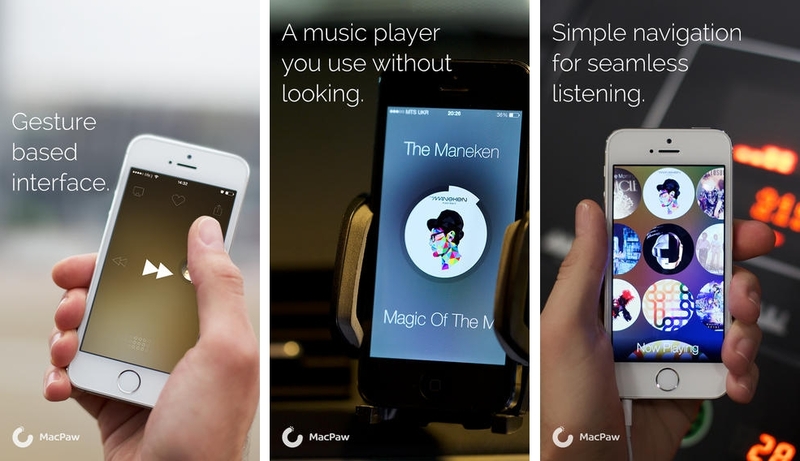 It can also facilitate free transfer of music from your computer to iPhone with a single tap. Forget about having to connect your iPhone to a computer with an annoying USB or going through painful syncing with iTunes. With one of the best free music players for iPhone for offline usage by your side, you don’t have to worry about a great sonic experience. 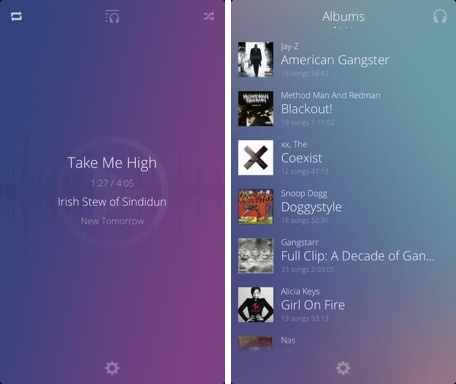 jetAudio is a renowned music player for Android but it features on our list of the best free music players for iPhone for completely different reasons altogether. For starters, it boasts of lots of cool features not available in other music player apps. jetAudio can automatically sneak into your music library including tunes that are sitting in the iCloud Music Library, and is always raring to unleash a sonic assault on your ears the moment you launch it. Fancy much? jetAudio is also adorned with a dark interface, which looks great though, and its splendid ‘Now Playing’ view is loaded with some great options on the top of the screen such as customisable sound effects, an equaliser, and a nifty sleep timer that can automatically set your music to stop after a fixed interval of time. A minimalistic music player for iPhone, Beat music player sports all the basic features one can expect from a music player, albeit with a great design. But, the real USP of this app which makes it one of the best free music players on iPhone is its ability to control offline playback on the app with a lot of nifty gestures. For instance, Beat music player can seamlessly change the views between songs and artists, adjust the volume, and allow users to go back and forth to the playlist by pinching on the ‘Now Playing’ screen. What else has it going to be among the best free music players for iPhone out there for offline usage? There are some really awesome themes available in the app that give its UI a strange feeling of depth, while there are some other magnificent themes that can be purchased. When it comes to a clever display that can the entice the user at first sight, I would say Marvis Music Player is one app that does a pretty good job at it. The novelty factor here is that this brilliant app displays everything such as the list of mp3 songs on your device (local & iCloud library) in a beautiful 3 columned view, while the artist and album images rest on the cover. So, a song becomes a…list, if that makes any sense. The app also boasts a dark theme and allows swiping between screens with a rather unique way of displaying views. Moreover, Marvis expands the album contents right below it instead of segueing to a new view when you tap on an artist/album. The only downside is that this app supports ads which can only be removed through in-app purchases. If I were to talk about the ability to play diverse genres, then Jukebox would take the cake as one of the best free music players for iPhone, and Beat would come on top insofar as great playback features are concerned, but Boom is a unique app that blazes its own trail. 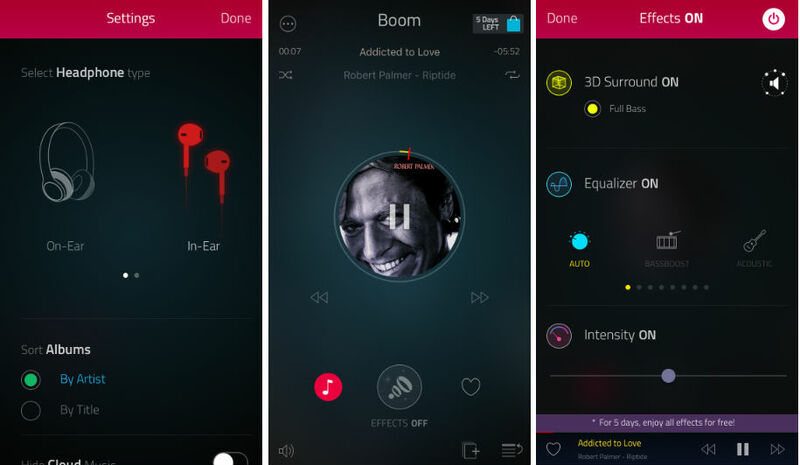 Boom music player proffers a gamut of amazing predefined equalizers, as well as a fully-customisable 5.1 surround sound for headphones/earphones. 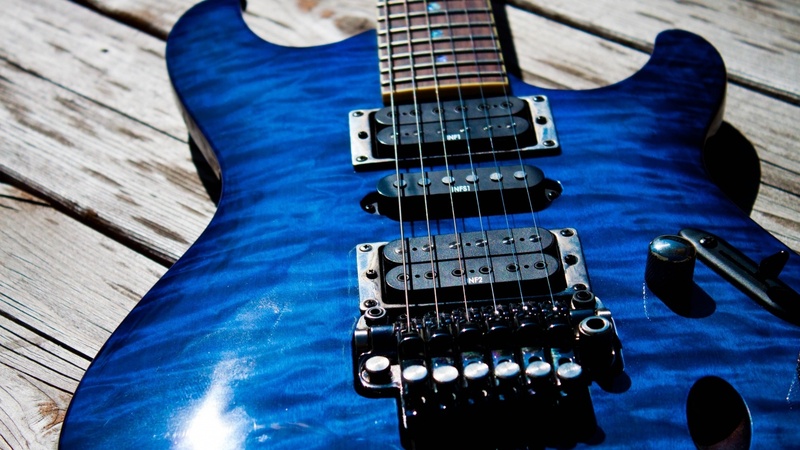 All in all, it offers a stupendous level of customization goodies in sound quality. Furthermore, users can choose the type of headphones in the app settings. Coming onto the UI, the interface is sleek and clean and makes it easier for users to walk through the song playing process thanks to its easy left/right swipe feature to change between tracks. 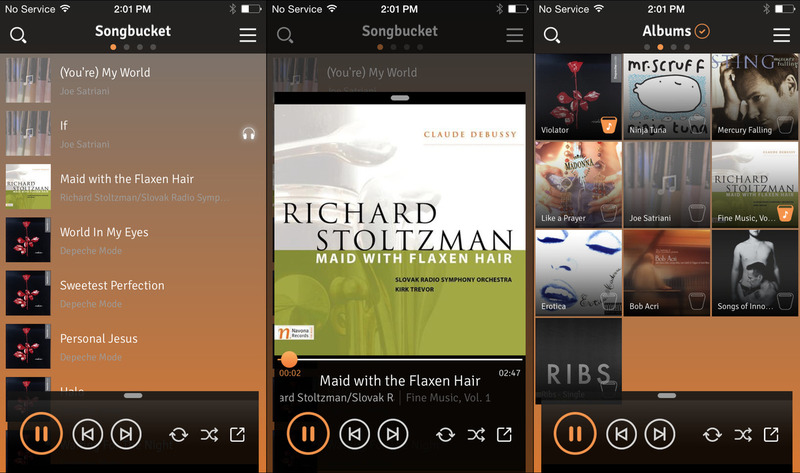 Songbucket is a free music player for iPhone that allows users to add songs, albums in bucket shaped widgets, which are a replacement for playlists. The buckets can be filled with songs or even emptied based upon your mood. The Songbucket app also makes access to all the basic controls such as play/pause, repeat and shuffle a cinch without having to pull the now playing tab up. What else has Songbucket going that injects it into our roundup of the best free music players for iPhone? This wonderful offline app also boasts a decent UI with a dark theme, that quite honestly gels well with the interface. 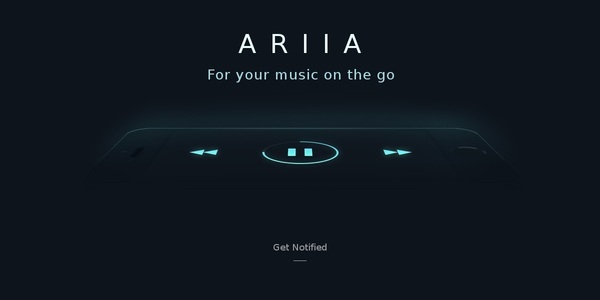 If you are a fanboy/fangirl of music players that look very basic with a minimalistic UI, but in a good way, look no further than ARIIA. It comes loaded with diverse colour profiles in nice dark and light modes. Further, ARIIA can also be gesture controlled. Its developers claim to have designed it to specifically help you listen to music while you are driving. Isn’t it great to come across one of the best free music players for iPhone that comes with very intuitive gestures? Thanks to its gesture controls, users don’t really have to look at their phone screen as they swipe left to play the next song, right to play the previous song, or swipe one finger up to increase the volume, and vice-versa. However, the downside with this app is its shoddy ability (or, lack thereof) to choose a playlist that you wanna play. Because, it needs a workaround wherein you will have to first launch the Music app, start a playlist, and then switch to ARIIA. 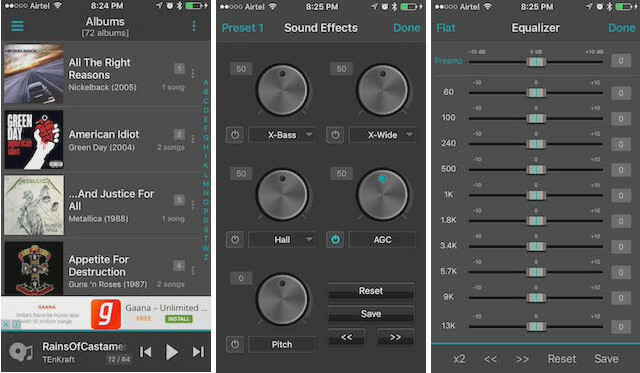 Stringer is counted amongst the best free music players for iPhone since it proffers a new way to listen to music on your device. How? Well, it allows you to build smart playlists, listen to music on shuffle, and automatically sorts your complete music library by presenting a single, unified thread of all the songs. Further, it ensures you have complete control over your shuffle experience as it allows you to pull the string to the right or left and even add more tracks from related music or the current artist/album. Stringer is fully compatible with iPhone, iPad and iPod touch. Another solid gesture based behemoth on our list of the best free music players for iPhone, Listen is adorned with a decent responsive UI that relies on gestures to control music on your fingertips. Some of the finest features of Listen comprise its ability to show and hide songs in the iCloud Music Library and share your favourite tunes through Twitter, Facebook and email. 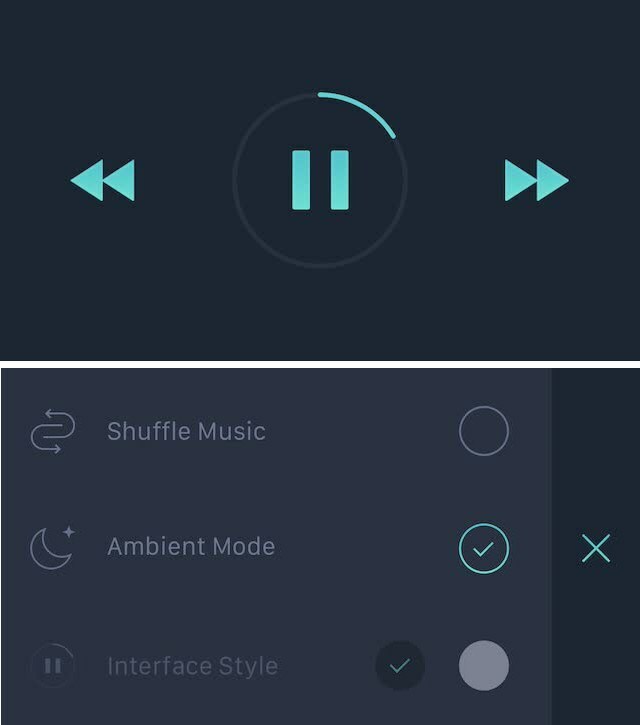 Not to mention, a brilliant toggle for “Shake to Shuffle” which lets users decide on what song they wanna listen to within the app. All in all, the Listen app is a decent music player that can give you a great aural experience if you are seeking some innovative gestures in the music player of your choice. Musio music player is a unique app that banks on some offbeat touch features on its interface. If you prefer swipe gestures in email apps such as Mailbox and Mail, then Musio is the best free music players for iPhone! There are many things that can be done through Musio such as using intuitive gestures to add songs to a playlist. 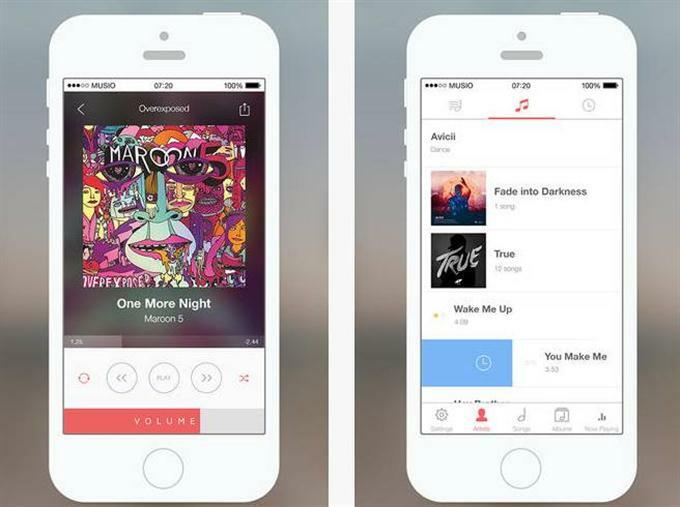 While a short swipe adds mp3 songs to queue or playlist, a longer swipe will remove them from the queue. Previous article10+ Cool Telegram Messenger Secret Chat Tricks To Become a PRO!